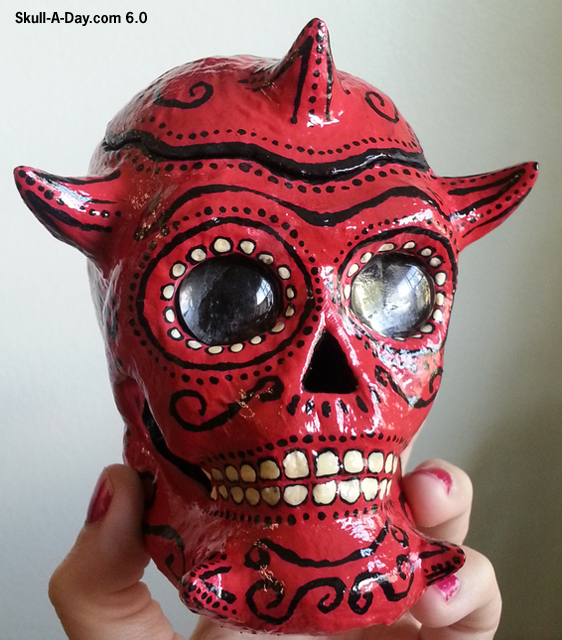 This devilishly handsome figure was made by Michelle C. Stewart of Seattle, WA. She created it from Papier-mâché and acrylic paint with glass eyes. 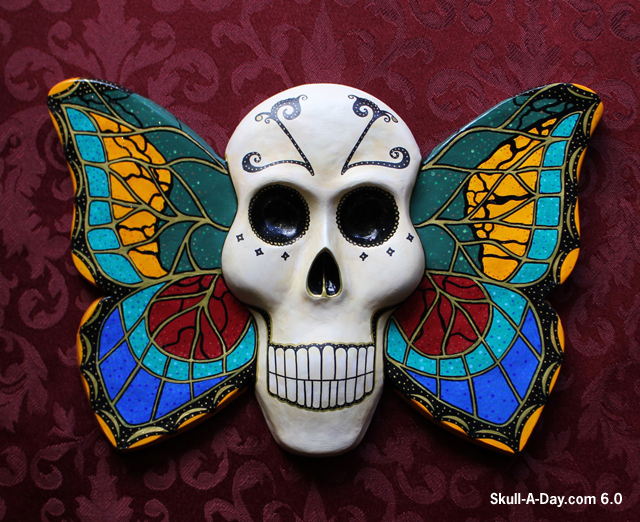 Sugar skulls aren't always my favorite(sorry), but this bad boy has me grinning. He's got traits of sugar sweetness, but that's just a glossy exterior hiding the true sinister motives inside. Plus, it looks like a pinata and I can make candy a metaphor for "sinister motives". Ha! Thanks for sharing, Michelle! THIS CONTEST IS CLOSED! Thanks for participating! Life is full of art. Sasha Berry chooses to work with talented artists whose perception of the world is so different and avant-garde, it gives life to her scarves. She creates scarves that combine aesthetic creation in a modern style to offer daily the opportunity to bring a piece of art to your body. The scarves are soft and pleasant to wear because they made of fine fabrics. 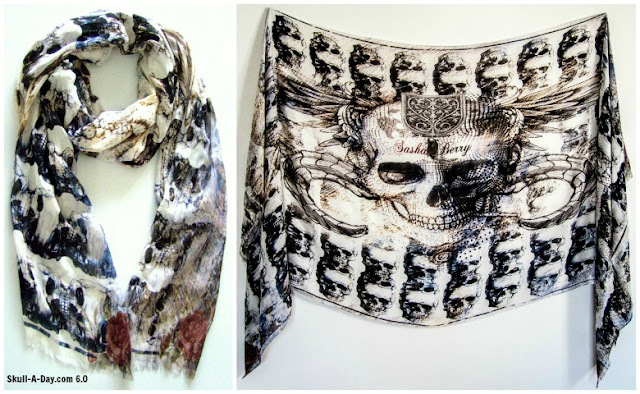 Many of the scarf designs incorporate skull motifs. Sasha Berry would love to giveaway 3 of her wonderful scarves with 3 lucky Skull-A-Day fans! PRIZE INFO: 1 scarf in one of the above colors (pink, blue, or cream) with the Skull Snake print. Each scarf measures 90 cm by 200 cm (35 in by 78 in). HOW TO ENTER: Scarves can be worn with many things and to many places. To enter this contest, comment with an answer to this question. If you were to win a skull snake scarf, where would you wear this scarf? For example, I would tie mine into a vest and wear it in Chicago, IL to lunch with the Skull-A-Day guys, before our Skull Appreciation Day festivities. CONTACT INFO: The winner, chosen at random, will be contacted via email by one of the Skull-A-Day editors within 7 days of the end of the contest. If that winner doesn't respond, another winner will be chosen. With your comment, please INCLUDE YOUR EMAIL ADDRESS!!! Entries are only valid with this information. WHERE TO ENTER: All entries must be made on this blog post, on Skull-A-Day.com. You CANNOT enter this contest by commenting on Facebook, Twitter, or Google+. CONTEST CLOSES: 11:59:59 PM Eastern USA Time Friday, May 3, 2013. PRIZE SHIPS: This contest is open to all skull lovers around the world. IF YOU DON'T WIN: Don't fret, Sasha Berry is offering a a free Black London Skull scarf, from the Sport Collection, with any purchase all May till June. Put Skull-A-Day before your name at checkout. 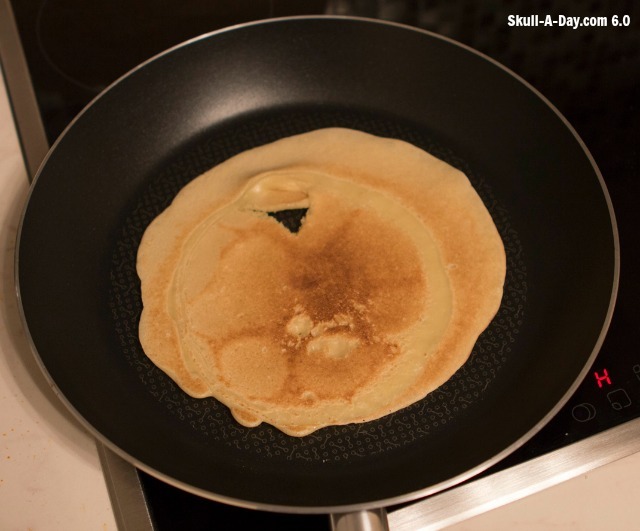 Today's skulls were found on pancakes. Wendy Carney-Hatch's son ate this pancake after she took this photo. Slashø found a skull in the pancake they were making. Keep sending those pictures in, we always love seeing what our skull hunters find. Anyone is welcomed to participate, it's fun and it's easy. 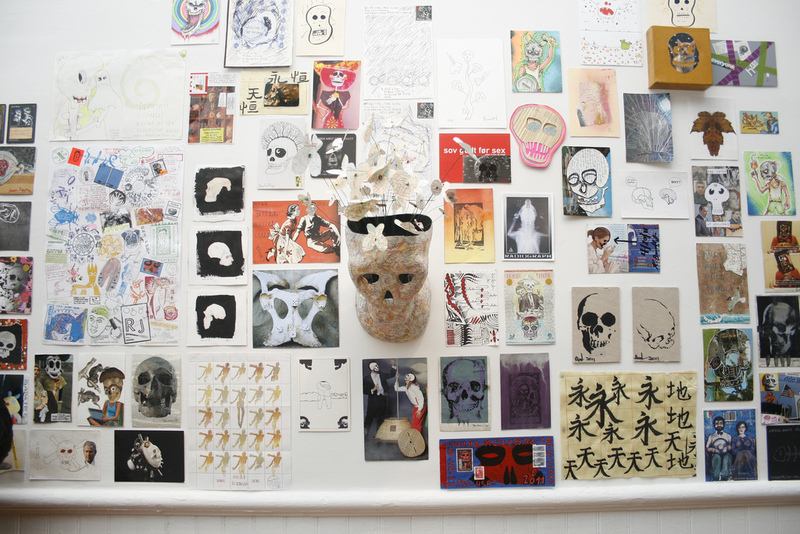 If you see a simulacra skull, photograph it and send those pictures in to our submissions address with a little something about what it is really and maybe a little about you. 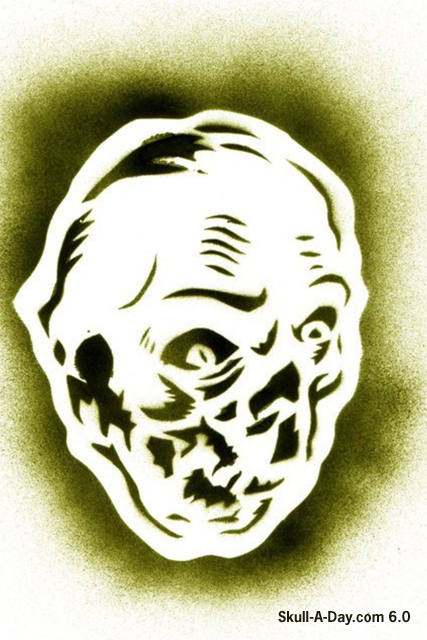 If you're new around here then you might not recognize the name Matt Gregg, but if you've followed Skull-A-Day long enough you would definitely recognize this and this. 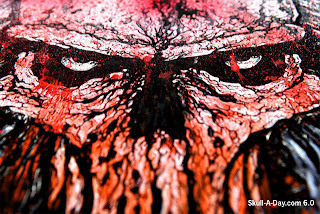 Now Matt is back with his latest and most gruesomely awesome painting created with spray paint, acrylic, ink, blood, and xacto beatings on canvas. Simply put, this is f'ing awesome! Sinister and determined, this demonic overlord WILL devour your soul! I don't know if Oderus Urnugus was any kind of influence, but I'll bet he would like this. Thanks again for sharing, Matt! Don't forget you have until 11:59pm Eastern USA Time Friday, April 26, 2013 to make an entry comment to win a EP Prizepack from SATURNS. The Prizepack includes a copy of their EP, a t-shirt, buttons, and stickers. You can find the original contest post by clicking the side bar ad, or this link. Take a listen to their EP here. In early March, Job Fitz Gerald said "They are have a egg decorating contest at work. Going to show them a proper egg." 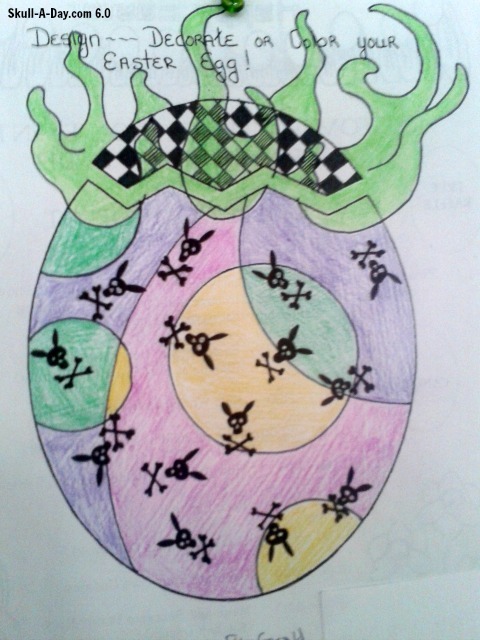 For that contest, he drew this bunny skull covered egg. I love seeing how people decorate eggs for Easter. This one is very colorful, yet sinister. I love that the skulls aren't regular ones, but bunny skulls. I hope Job won for this great creation! 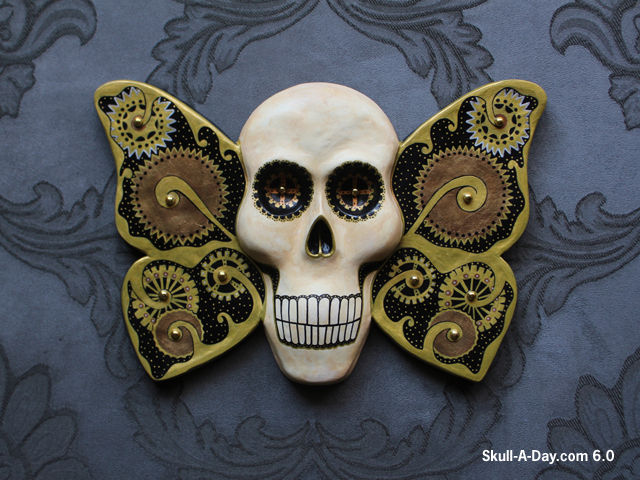 Ceramic Artist Lisa McPike Smith of Hep Cat Artworks, told us: "I have been a long time fan of Skull-A-Day since I started my 'career' making and selling skull beads in college so I could afford art supplies. The trend has not died yet and my skull items continue to be my top sellers. I did a 7 deadly sins series of which I have shared and one is a piece that came directly out of a pit-firing and is still in the ash." 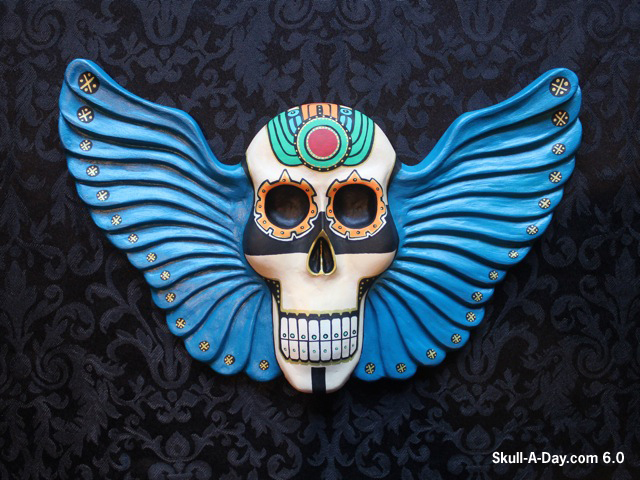 It is wonderful yo see that you have a unique styled skull that you are able to incorporate into some of your work. I am especially fond of the picture you created with the multiple parts, it reminds me of some sort of backdrop mock-up for a movie that could be taken away or added to tell the story. 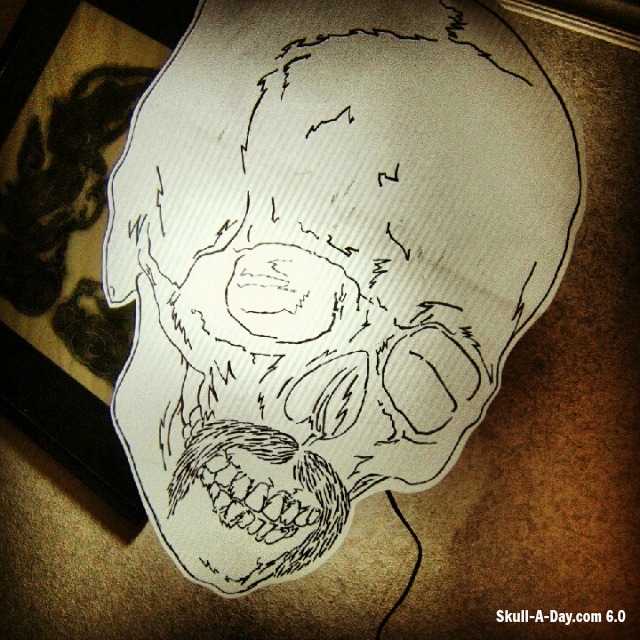 Thank you for sending your work to us to share and for being a member of the Skull-A-Day community. My Skulledelic design is now available on a limited edition silkscreen poster available only from Krause Gallery in NYC! 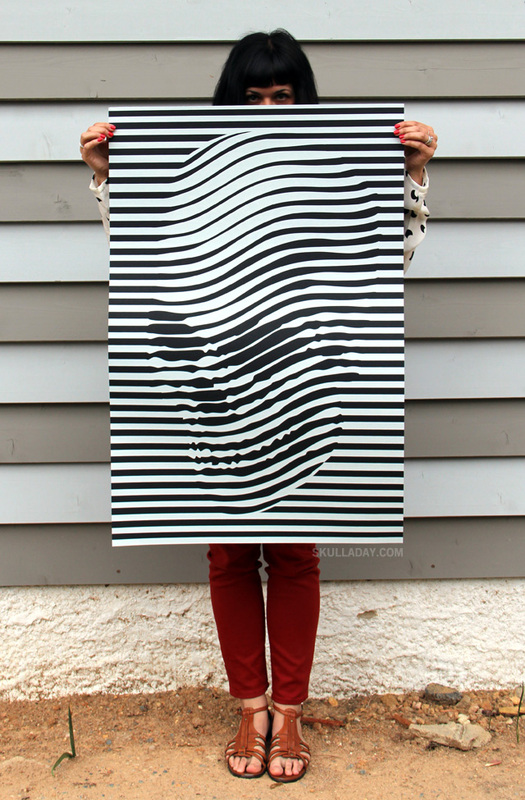 Each 24 x 36 in (61 x 91 cm) poster is printed in white ink on black acid free paper. Only 100 have been made and they are all signed and numbered. To purchase one visit Krause Gallery's store HERE. *Thanks to my friend Meena for modeling this poster for me! 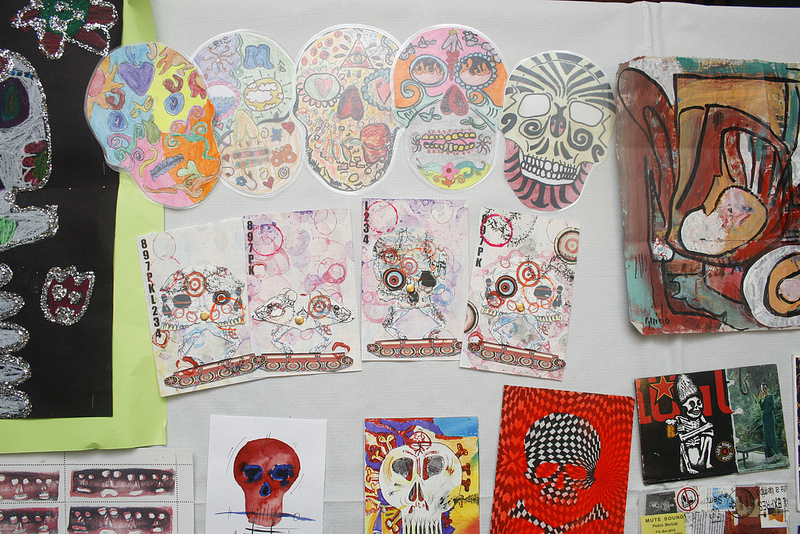 Jules Andrault is in here today to share this collection of skulls from graphic school. 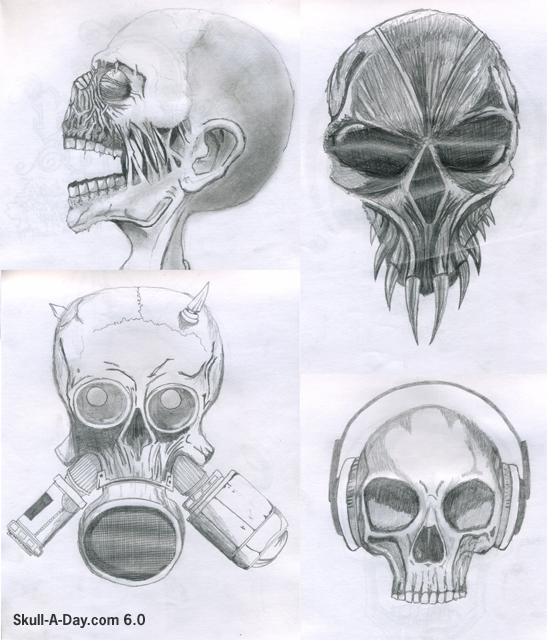 Shades of grey provide a great graphite representation of some darker skulls. Without the dark there is no light. 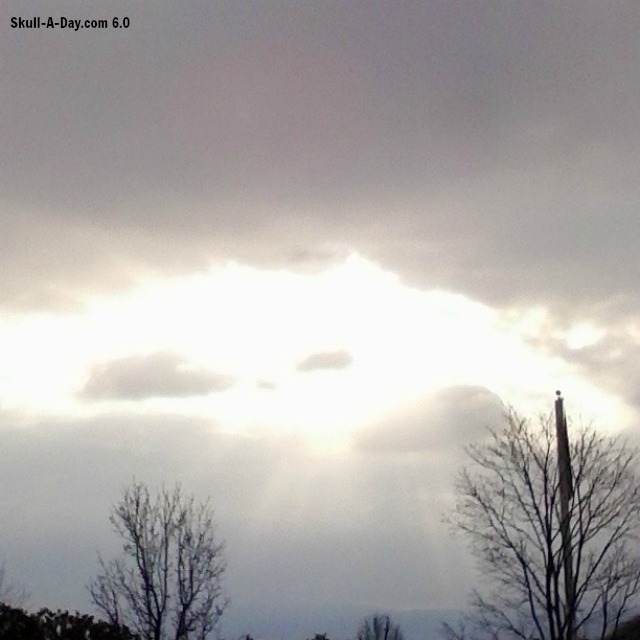 Don't be scared of those darker images, be thankful that they remind us to revisit the brighter things in life. Keep up the great work, Jules! 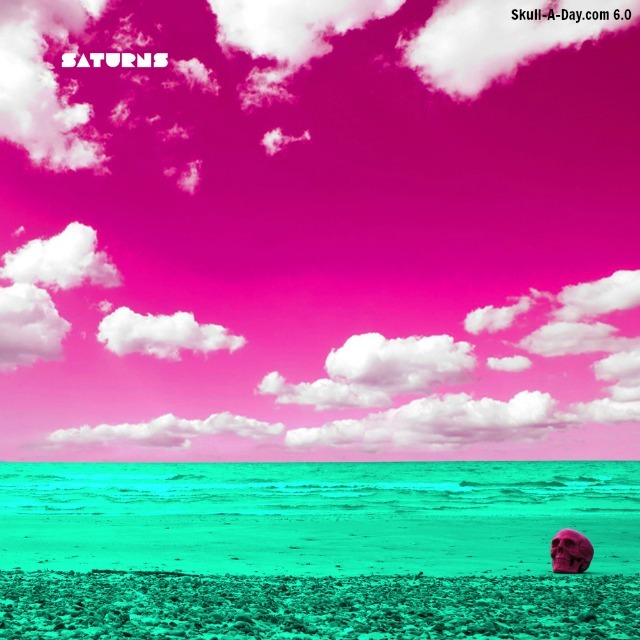 SATURNS is an electro-pop band from Toronto, Canada. They have a 4 track EP featuring their brand of dreamscape music. Their mascot, which travels with them, is a giant pink skull. They want to share their music with the world. 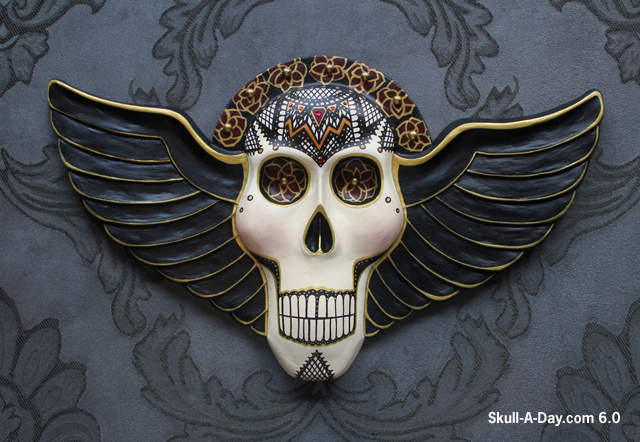 We're big fans of great music and skulls here at Skull-A-Day. 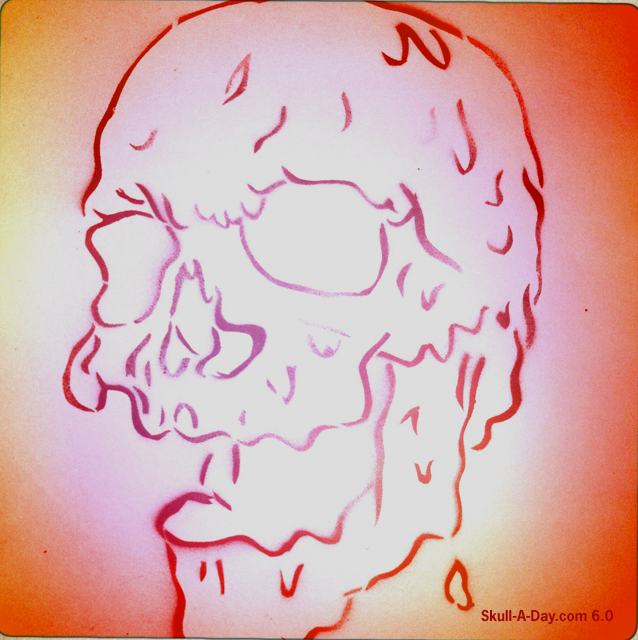 To help share their music, they are giving away an EP Prizepack to one lucky Skull-A-Day fan! "SATURNS is Toronto cousins Lukas Cheung and Bryan Sutherland whose collective creativity emerged spontaneously over a weekend, days before moving out of a cat ridden house. Using two dysfunctional laptops and one broken synthesizer they sculpted beats late into the night and upon playback at sunrise, agreed to pursue the partnership -- both are allergic to cats. Their melodic debut may disguise them as electro-pop but their lyrics spell a different story. The EP explores themes of dream travel and escapism in a fashion that sculpts a world entirely their own. The opening track DIAMONDE constructs a fantasy palace which lures those who lust after riches to their own demise. "Diamond doorsteps stay the same as the warriors decay, scriptures peeling off the walls, there's no echo in these halls". The Zen-like metaphors may leave some listeners scratching their heads, but the catchy melodies will balance out the experience." You can find out what the band is up to on their Facebook and Twitter pages. You can hear their music on their Bandcamp, Last FM, and YouTube. You can also hear the EP here. 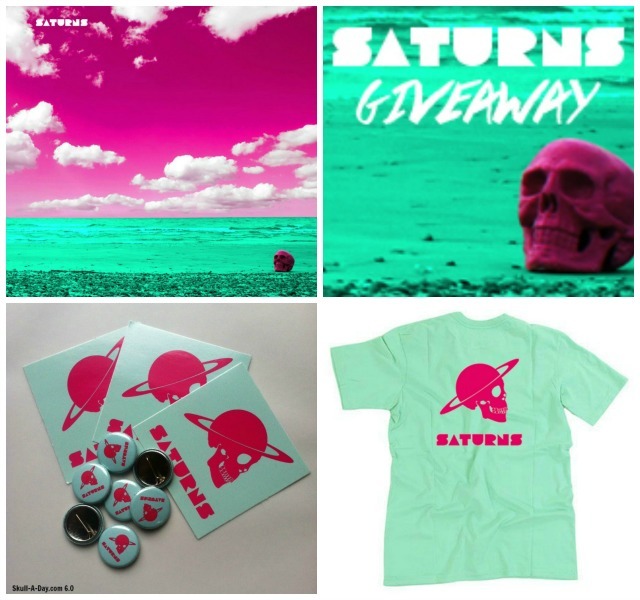 Saturns EP by SATURNS PRIZE INFO: A SATURNS EP (enclosed in screen printed Envelope), a T-shirt, stickers, buttons, and poster. 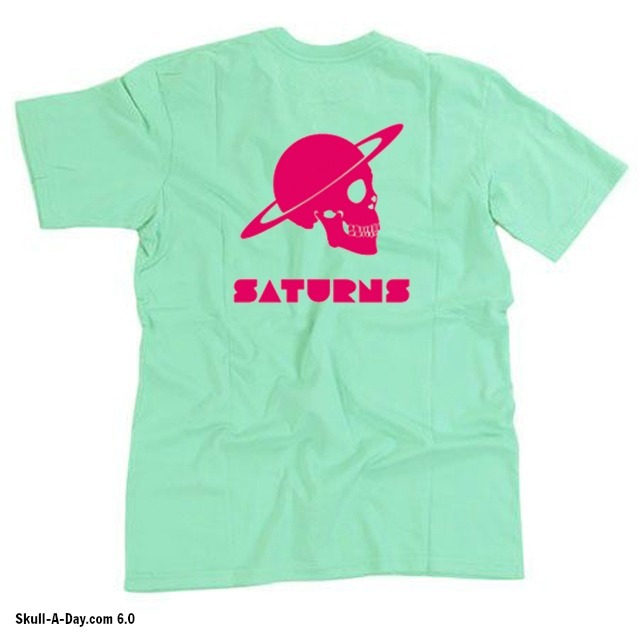 HOW TO ENTER: SATURNS takes their pink skull mascot traveling with them. To enter this contest, leave a comment below telling us what adventure you would have with a large pink skull. For example, I might take mine to a fair because it reminds me of cotton candy and those fortune telling machines. CONTEST CLOSES: 11:59:59 PM Eastern USA Time Friday, April 26, 2013. IF YOU DON'T WIN: You have SECOND CHANCE to win on their Facebook page. If you like their Facebook page, they will randomly select a second winner from the new likes. 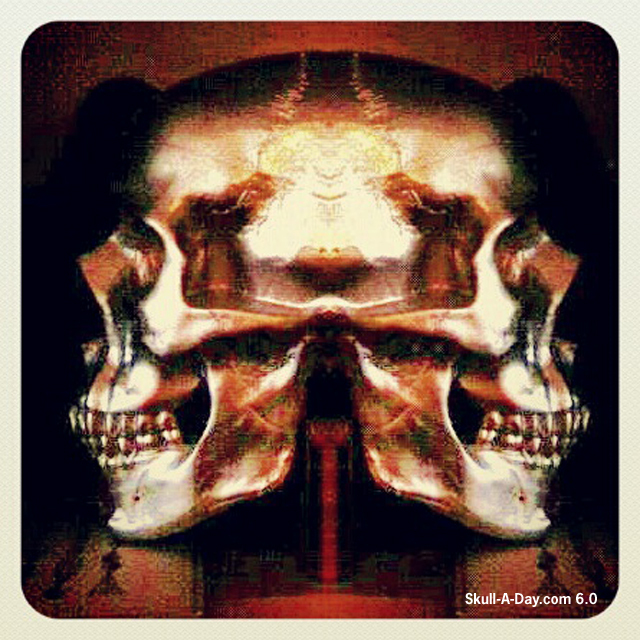 The official Skull Appreciation Day 2013 celebration will be held in Chicago this year and we've got some great plans afoot! We'll be posting details soon, but in the meantime we want to let you know of one way you can participate (no matter where you are in the world)... mail us a skull! For the previous 2 years we've had people send in mail art for us to display at our Skull Appreciation Day exhibitions and this year is no exception! Want to take part? The official call for entries with full details is HERE. If you're not familiar with mail art, the idea is simple, anything that can make it through the mail system with proper postage on it is acceptable! Many people like to stick with 2-D work on a standard sized postcard, but the sky's pretty much the limit. Need some inspiration for what to do? Check out some of the submissions from the last few years on the Skull Appreciation Day Mail Art blog! While on vacation in Massanutten, VA, I found some skulls. This one was taken early in one morning. 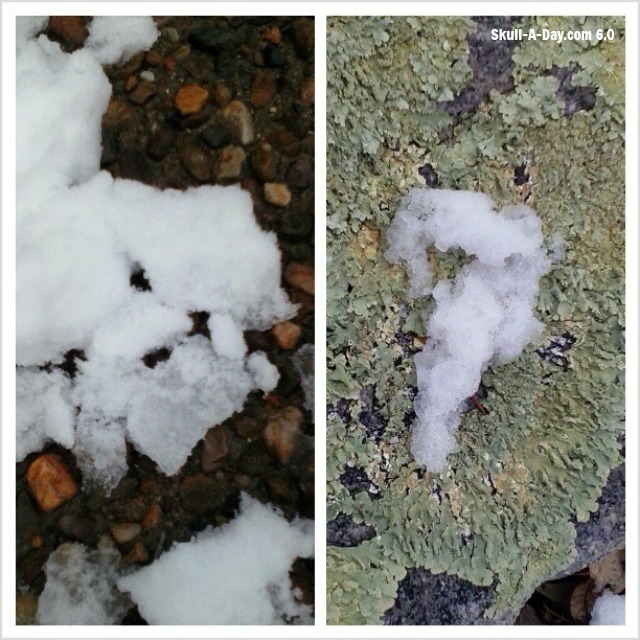 These were found while my daughter was building a snowman. 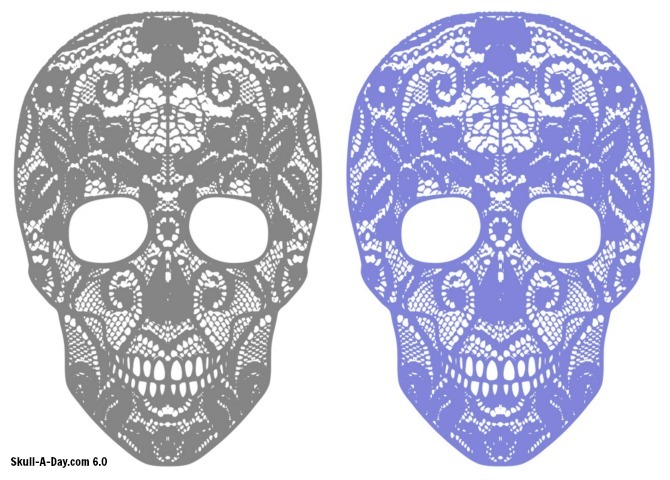 Choncey Langford is here to stylize our Saturday with these 3 stencil skulls: Tres Craneo Plantilla. Even though they're all stencils this is a nice trio of various styles. I could easily see these working well for other mediums. Plus, green is my second favorite color, behind black. Here's to everyone having a great "green" day! Thanks, Choncey! EJ Justice in Georgia, use Noah's 258. Cross-Stitch Skull to needlepoint a Christmas gift for a dear friend. We received this submission a while ago, but it got lost in the shuffle of regular submissions. She mentioned at the time of submission, "Now I'm looking for an old clock or barometer, with a convex glass face, that we can use to frame it for the appropriate amount of leer." I'm hoping she found that, as it would give an extra eeriness to it! We love seeing what people create using our available Free Stuff. 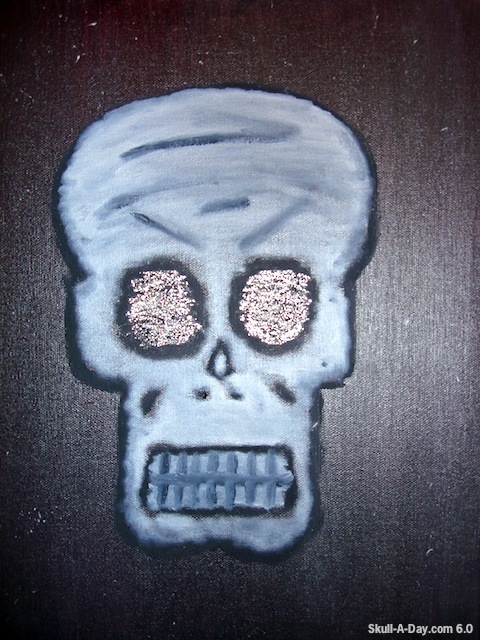 If you make something using something from the Free Stuff section of Skull-A-Day, please submit it to us! We'd love to share it! David Woodward of Toronto explained this is "my own drawing traced onto mylar for a moustache-themed show". It's been backlit. Mustaches have been a hot trend for the past few years. Before that, it was rare to see a guy sporting only a mustache. I'm used to guys that have a beard to accompany that 'stache. I love seeing David's creative version of this trend. Archaeologically speaking, there have been ancient corpses found that still have hair. Do you all know of any that still had a mustache? Comment below if you do. 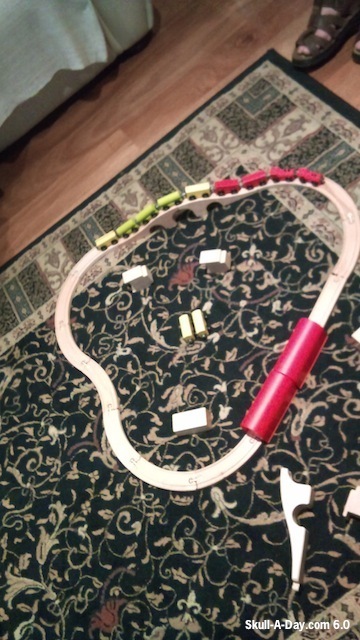 Five year old Oliver in Perth, Western Australia made this wooden train skull. Proud papa Dave told us: "I immediately thought of Skull-a-day when I saw it. 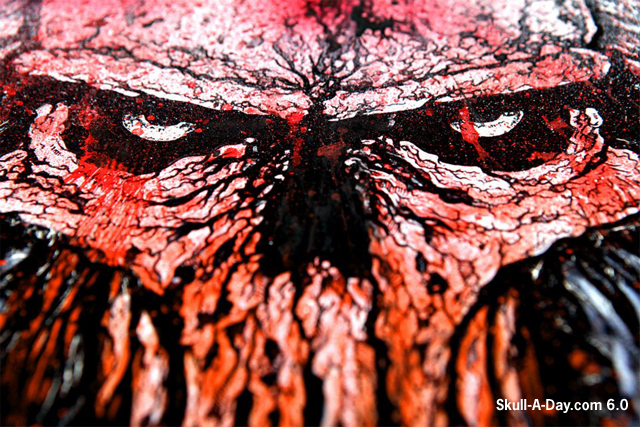 :)"
Thanks dad for capturing and sending this piece of skullrific artwork. We always love to see what some of the youngest members of the community have to offer to the Skull-A-Day project. "At work or play, I use my skull each and every day". That's the motto of David Machen of Woodward, Toronto. The skull he's using today is a HydroCal casting from his studio-made silicone mould rubbed with silver polish and enhanced with some basic photo editing with his phone. 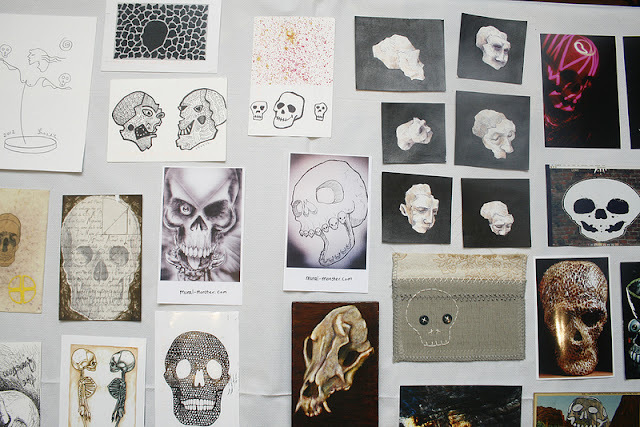 Of course we love the skull it's self, but there's a lot to be said for presentation. It's amazing to see all of these beautiful images created with just our phones. Heck, even I took this one myself. Great work on presenting your "fantastic photo", Darren! 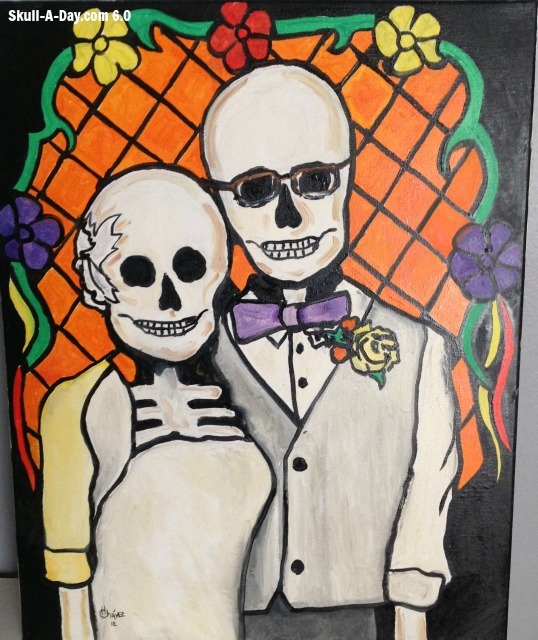 Kristina Chavez said "My father, Henry Chavez, of Brownsville Texas, painted this picture for my husband and I for our wedding in October of 2012. He knows how much I love skeletons. He took a wedding photo and turned us into our own Dios de Los Muertos." 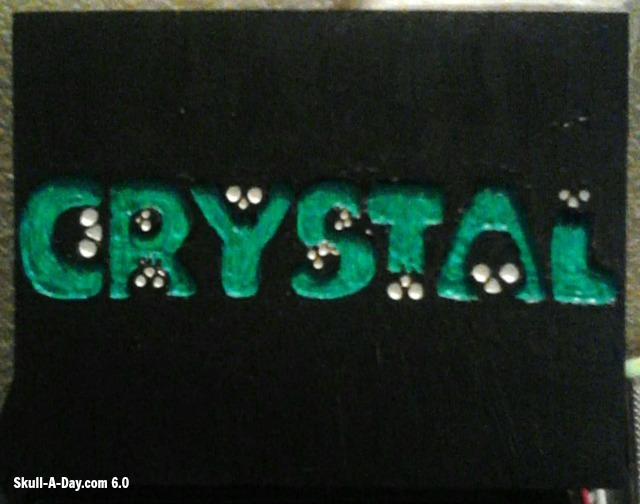 I love personalized handmade gifts. This one was truly made with love. 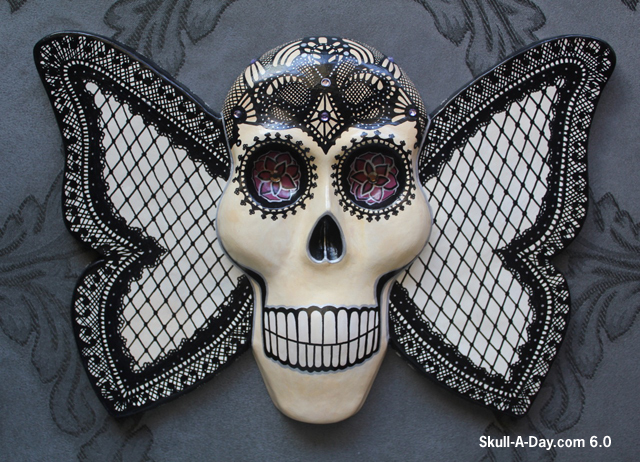 Kristina is a lucky lady to have such a talented father, that turned the couple into calaveras. Weddings are full of memories, and this is a great way to memorialize that day. 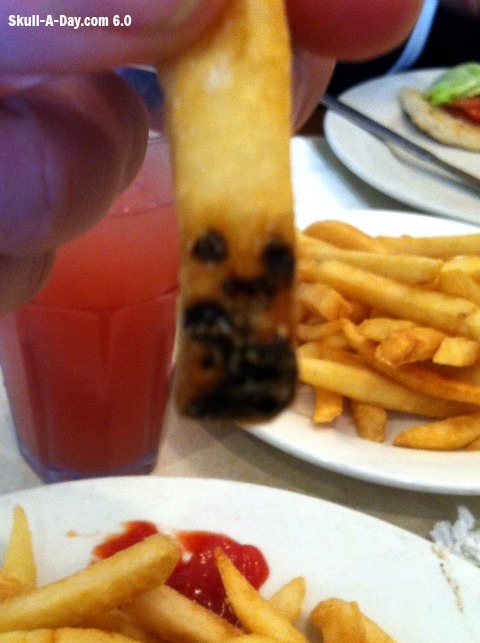 Today's skulls were found at restaurants. "Alex Arroyo MD of Brooklyn New York found a french skull fry in his son, Colin's pile." 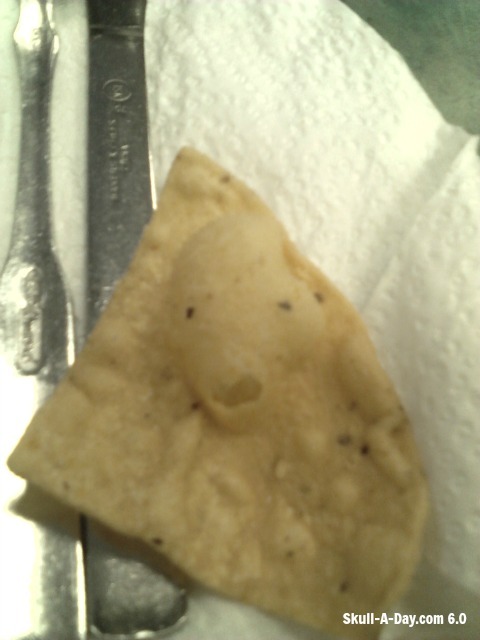 Wilder Contreras said they found this "Skull or alien skull found at a restaurant I enjoy eating at." 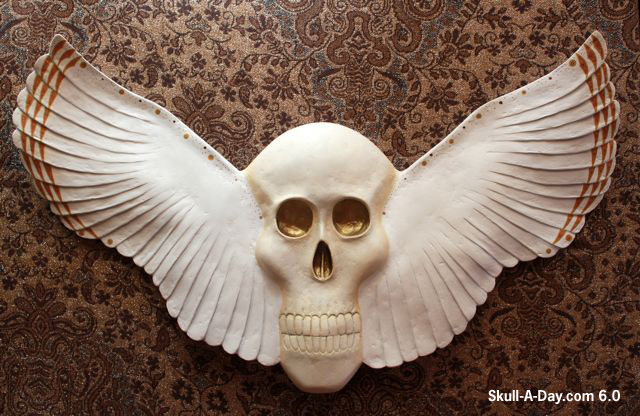 Angel Salavec is to blame for this almost overwhelming load of wonderful winged skulls. She apologized for sending so many, and it's not often that we post this many pics in one day, but I couldn't help but share the entire flock of cranial creations. 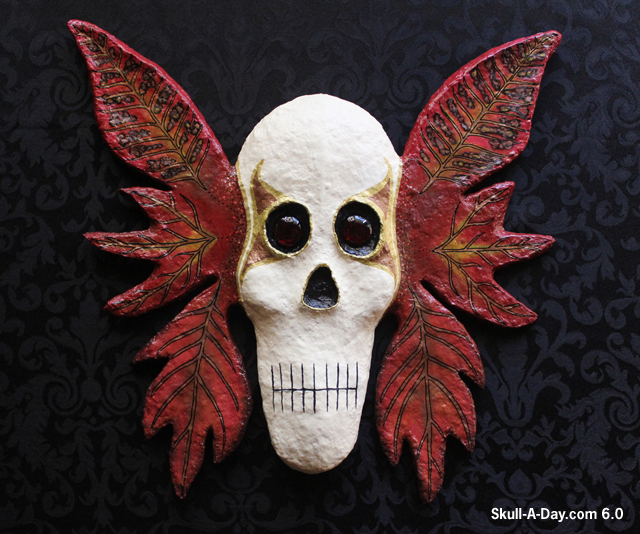 These handmade paper mache and plaster cast wall skullptures are all so different yet the same. 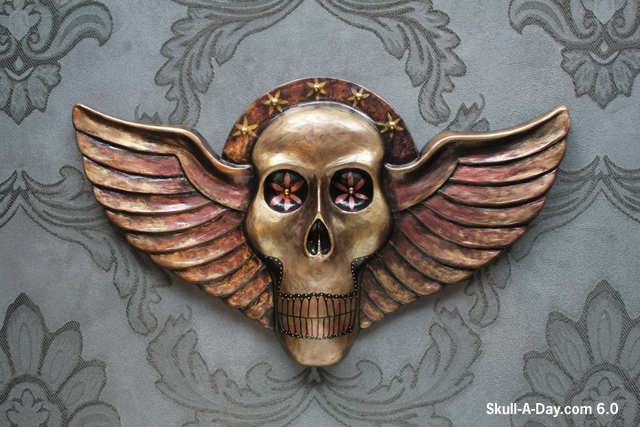 Believe it or not, there are even more skulls to check out in Angel's Etsy store. Even throughout a common theme she manages to create vastly unique characters. The variety was demanding of display so I had to share them all with all of you. Thanks for spreading your wings, Angel! Artist Richelle told us: " This oil on canvas piece from my Shadows Series called 'Talisman' was done to show the bright side of the dark side." I love that this skull has eyebrows, we don't get to see eyebrows on skulls too often. Perhaps this is the lighter side that we need to see more of in the future. Thank you for sharing your work with us. 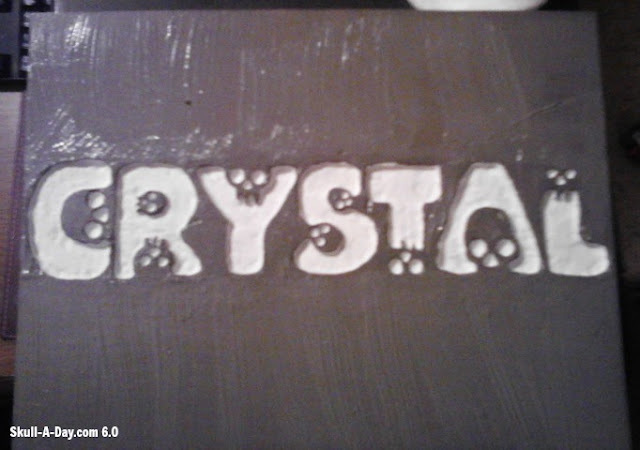 Crystal, used the Skullphabet #1 to form her name with woodwork. This font and the Skullphabet #2 are very intricate. I'm impressed that she carved her name using this font, into wood. 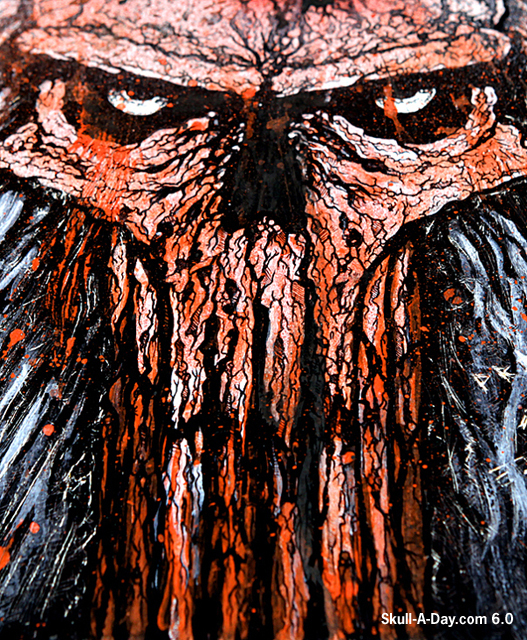 The painting is also very precise and gives a nice contrast, so the font elements...letters and skulls...stand out. 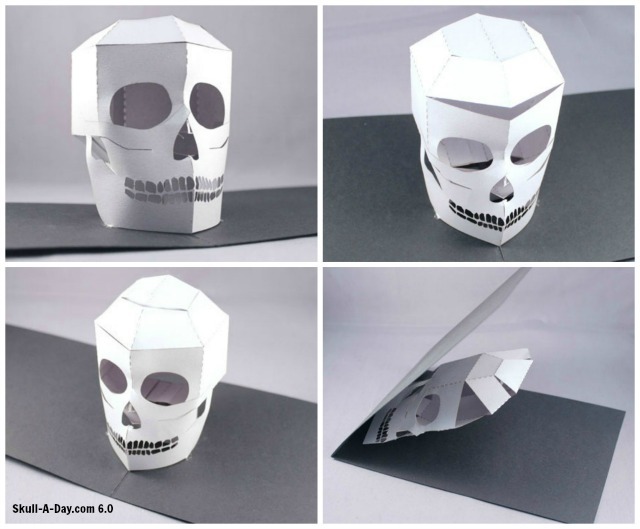 Carl Stevenson in London, England, of Paperfiction, created this laser cut popup skull card and vinyl skull decals. Lasers are awesome. These creations reconfirm that I need to play with a laser cutter. The precision they create, lend themselves to being used for fantastic designs like these. Carl shared these pieces with us, but check out his Etsy shop, Paperfiction, for more awesome creations. ORDER TODAY from Chop Suey Books Books. 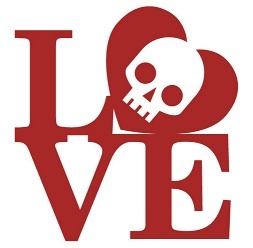 No permission is necessary to repost images from this site to your own blog, we just ask that you please give proper credit to the artist that created the piece and provide a link back to Skull-A-Day and/or the specific post it came from. The more links the merrier! Thanks for your support of the project. 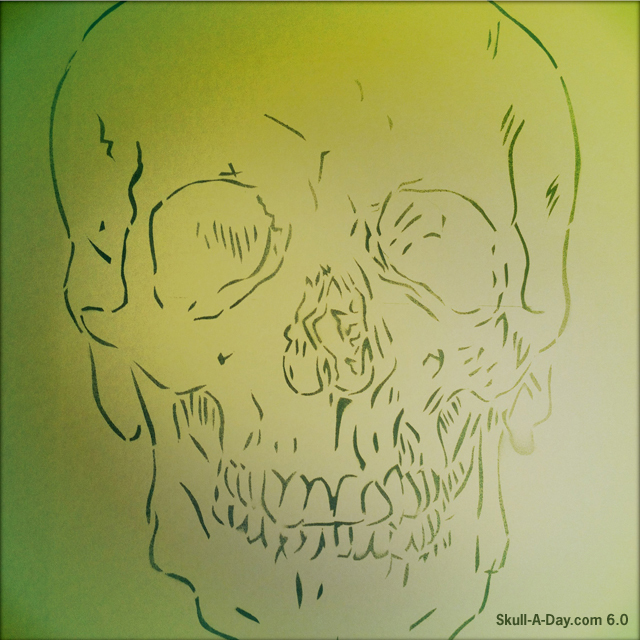 Skull-A-Day is a creation of Another Limited Rebellion. Powered by Blogger.